The Czech round of the puzzle GP will take place next week, the instruction booklet has been posted. 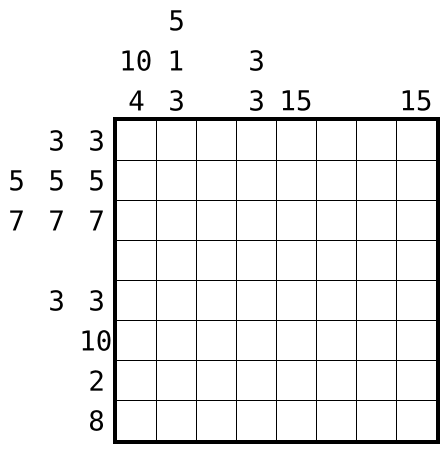 Here’s a practice puzzle for one of the types. Rules Place numbers from 1 to 6 in some cells so that no number repeats within a row or column. For rows and columns that have clues given on the outside, these numbers correspond to all sums of blocks of adjacent digits within that line, in the correct order. Furthermore, draw a loop that visits all cells without a number, passing horizontally and vertically from cell centre to cell centre. This entry was posted in Puzzles and tagged easy, japanese sums, japanese sums and loop, practice, variant on 2014-04-18 by rob.